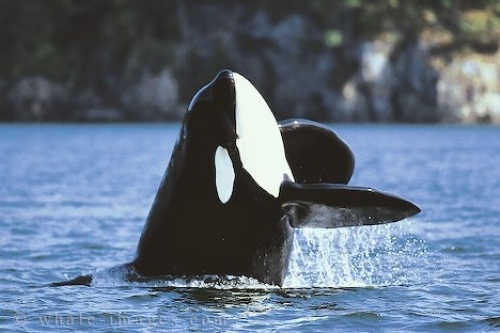 Sheer power is the best way to describe this orca whale as it was breaching! Breaching is typical marine animal behavior and this killer whale put on a great show as we watched his massive body almost fly out of the water vertically and straight up. This picture has captured the speed in which the orca appeared, with the way the water is coming off the pectoral flippers and the amount of the whales body is already above water - an awesome display of animal behavior. The photo was taken off the coast of Northern Vancouver Island.